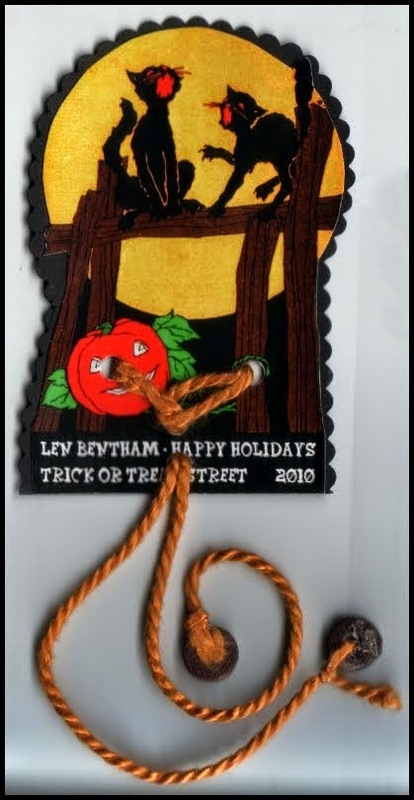 Happy Holidays: Welcome to Trick or Treat Street! Hurry up, everyone is here. I'll introduce you to them and then we can go trick or treating. Meet Artemus. He is a little annoyed because he forgot his treat bucket. We have that all taken care of because we stopped by his house on the way, his mum gave us the treat bucket to give to him. The dull sheen and the deep colouration to the apple skin has been achieved with about 6 or 7 layers of glaze and paint. He has a vintage apple leaf on top of his head. 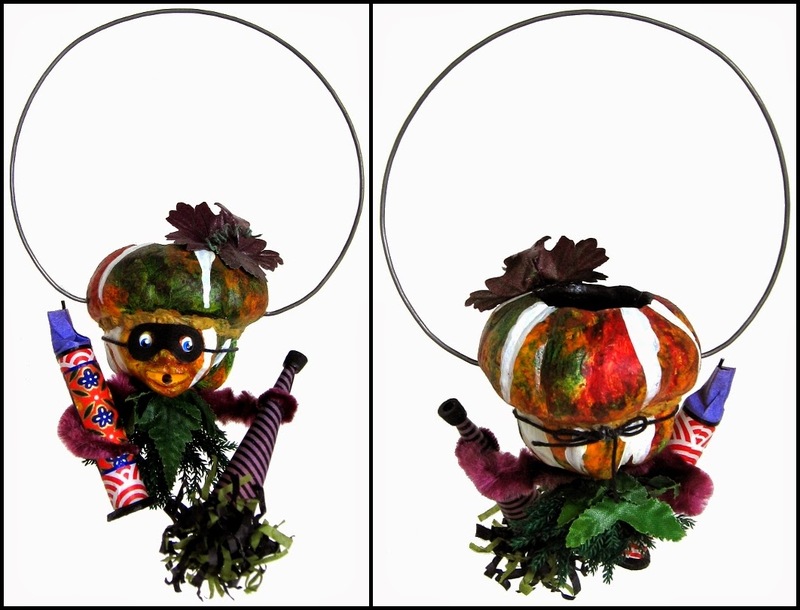 His arms are vintage chenille and his torso is created from vintage ball fringe pompoms. 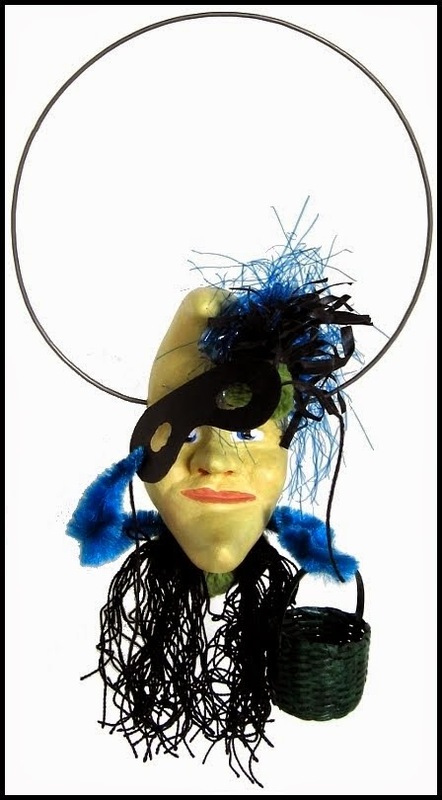 Artemas is wearing a handmade paper mask and is carrying a handmade party horn. The ornament is 7 1/2" from the top of the wire ring to the hand cut tissue paper fringe and 4 1/2" wide at the widest point of the wire ring. He is a candy container ornament. "Artemas has Attitude" - $45.00 US one only. Black Cat decided to come as a bush. He is very pleased with himself because the Byrd brothers got quite a shock when they decided to check out the nest. They have taunted him quite a lot lately. 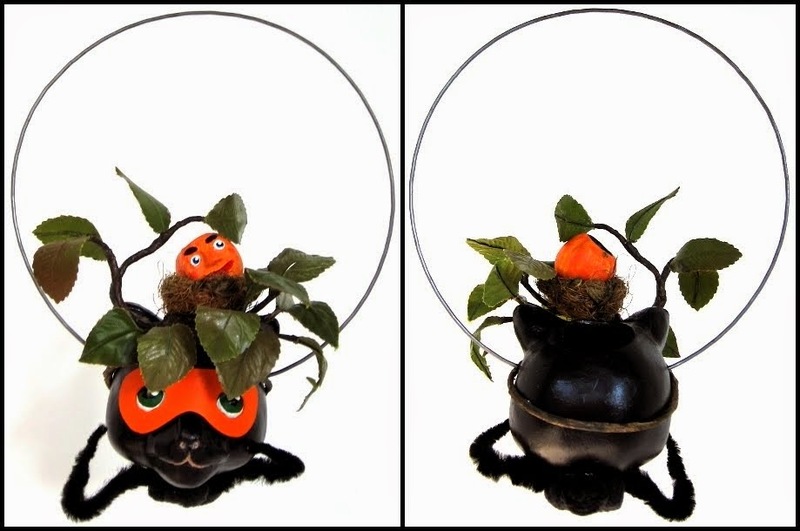 Black Cat's crown is made of vintage millinery leaves and wire. A handwoven bird's nest of wire and corn husk silk is securely attached into the branch crown. A tiny jack-o-lantern is glued into the nest. He is wearing a handmade paper mask. 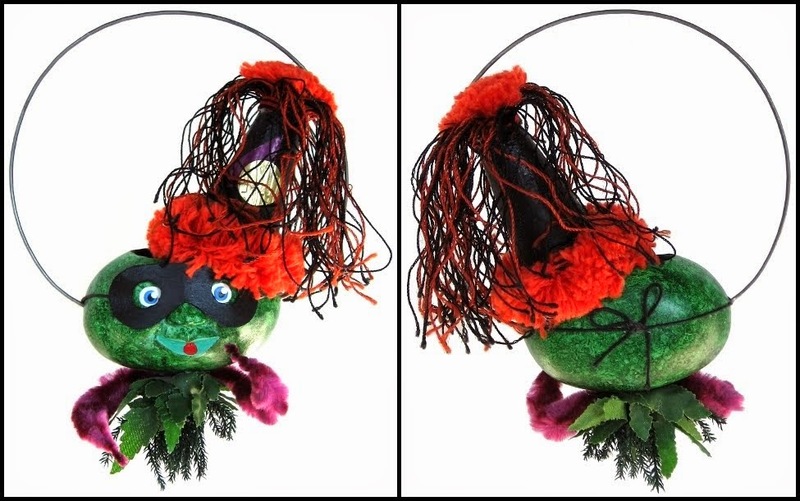 His arms are vintage chenille and his torso is created from vintage ball fringe pompoms. The ornament is 7 1/4" from the top of the wire ring to the base of his torso and 5 1/2" wide at the widest point of the wire ring. He is a candy container ornament. Cynthia decided to come as the notorious spy, Mata Hari. She has been enjoying walking around looking suspicious and rubbing her hands together as if she is contemplating "doing someone in". Cynthia is a purple topped turnip. Her colouration was achieved with deep purple and white overlapping washes. The leaves used for her top are vintage millinery leaves. Her arms are vintage chenille. On her bodice is an early vintage glass button surrounded by burgundy chenille. Her black vintage veil wraps her head swathing her in mystery. The ornament is 6 1/2" from the top of the wire ring to the base of her arms and 4 1/4" wide at the widest point of the wire ring. She is a candy container ornament. "Cynthia came as Mata Hari" - SOLD. Doris is dressed as Carmen Miranda. 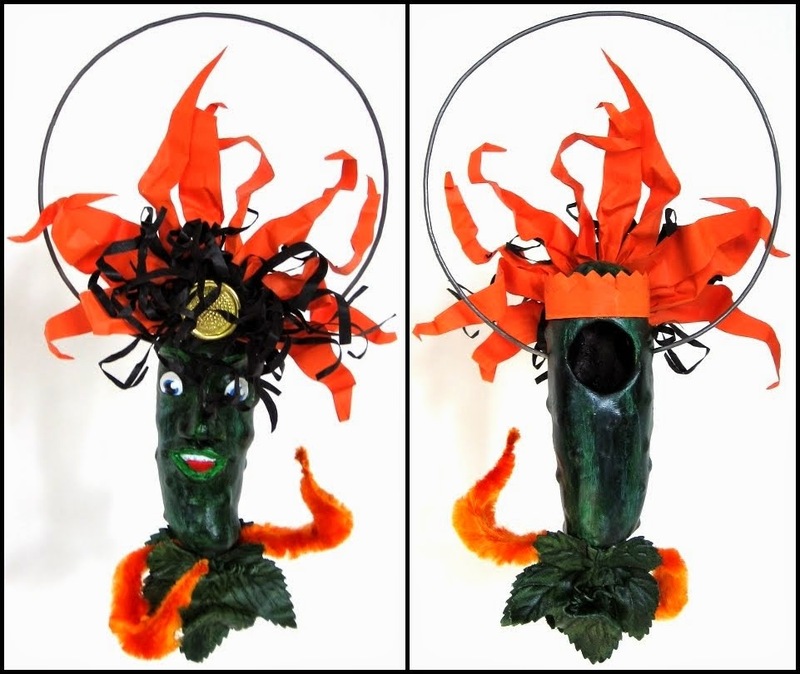 Doris loves all things Latin, so she decided to make a Carmen Miranda inspired head dress. She is one hot pepper! Her subtle colouration is achieved with 4 or 5 layers of yellow, orange, and red glazes. 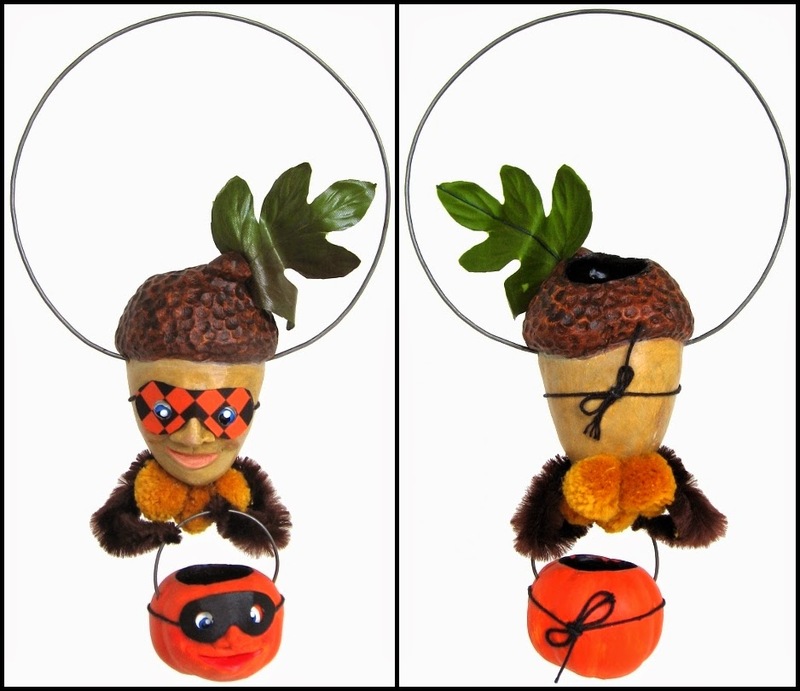 On top of her head are early vintage millinery fruit and leaves. Her shoulders are created from vintage ball fringe pompoms. Her arms are vintage chenille. The ornament is 7" from the top of the wire ring to the bottom of her torso and 4" wide at the widest point of the wire ring. She is a candy container ornament. "Doris came as Carmen Miranda" - SOLD. Edna loves Haute Couture and decided to come as a Paris runway model. Her pale complexion is definitely enhanced by her hat of blackberries, blackberry leaves and one very fine curved black plume. Her lovely pale colouration is painted over a bright grey green base coat. It is built up with 4 or 5 layers of yellow, lemon yellow, and soft brown glazes. There are areas where the green shows through very softly. 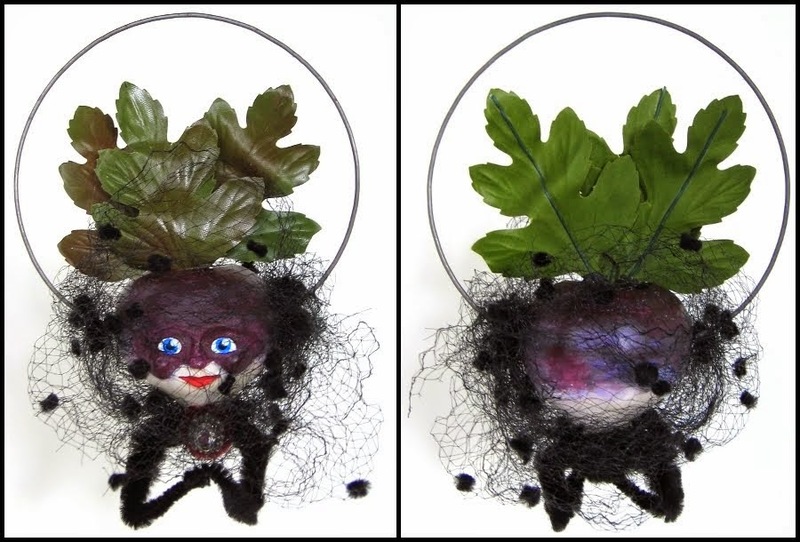 Her haute couture hat is created from vintage millinery blackberries and leaves. The early vintage plume sets of her dramatic hat. Her arms are vintage chenille. The ornament is 9 1/2" from the top of the wire ring to the bottom of her elbows and 6 1/4" wide at the widest point of the wire ring. She is a candy container ornament. "Edna came as a Parisian runway model" - $55.00 US one only. Julian decided to come as "King of the Forest" this year. He is feeling and acting quite regal, much to Black Cats annoyance. The rich colouration of Julian's head was achieved by using 7 or 8 layers of paint in yellows, oranges, and warm browns. It was painted on and patted off revealing the layers beneath. It has a leather like look and sheen to the surface. The crown on his head is made from a piece of vintage metal from a glass lampshade collar. A row of green cotton chenille yarn was sewn into the base for contrast. It is accented with green feather down and one brown feather. A brown vintage button finishes the crown. Vintage berries, leaves and floral pips accent the paper covered wire sceptre in his hand. He wears a handmade paper mask. His arms are vintage chenille. His torso is created from vintage fabric fern fronds and erica moss. 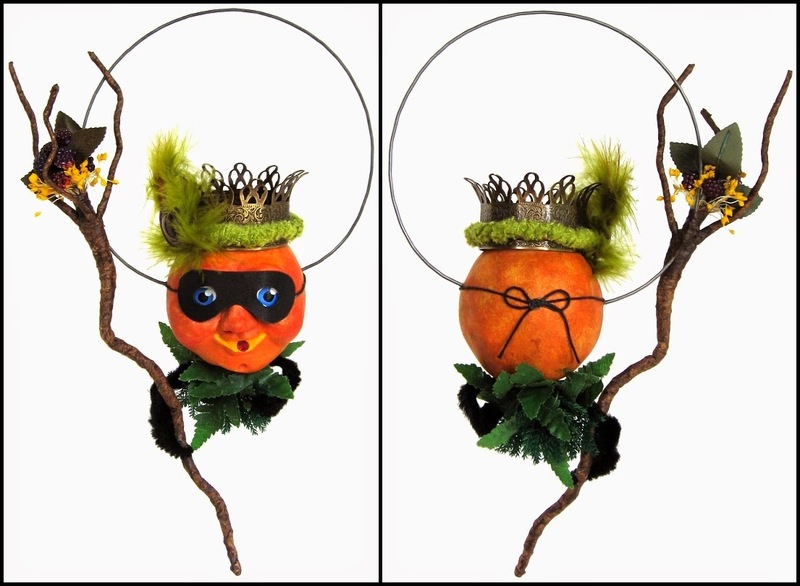 The ornament is 11" from the top of the wire ring to the bottom of the sceptre and 7" wide. He is a candy container ornament. "Julian came as king of the forest" - $65.00 US one only. Lester is ready to go trick or treating. His party horn will scare the pants off any unsuspecting people that he meets. Lester's grey green colouring was built up up from a yellow green base coat. 5 or 6 layers of paint have been added and then patted of to give his shell a lovely mottled appearance. He is wearing a handmade paper mask. His arms are vintage chenille. His torso is created from vintage fabric fern fronds and erica moss. In his hands are a handmade party horn and treat bucket. The ornament is 9 1/2" from the top of the wire ring to the bottom of his treat bucket and 5" wide across the wire ring. He is a candy container ornament. "Lester" - $50.00 US one only. Everyone so far has mentioned that Ron's treat bucket is as large as he is. He laughs and just mentions that he needs a LOT of sustenance to grow into a mighty oak. Five layers of soft browns and ochres have built up the subtle colouration on his face. His cap has had three layers added and patted off to give the cap a natural look. He has a vintage millinery leaf on his cap. His arms are vintage chenille. Pompoms from vintage ball fringe create his torso. Ron and his treat bucket are wearing handmade paper masks. The ornament is 8 1/2" from the top of the wire ring to the bottom of his treat bucket and 5" wide across the wire ring. He is a candy container ornament. "Ron brought a particularly large treat bucket" - SOLD. Larry has brought fireworks for later when we all gather at the bonfire. He loves noise so all of the fireworks he chooses end with an explosion. To further add to the racket he has his party horn at the ready. Approximately 12 layers of yellows, orange, reds, greens, browns and ochres have built up the lush colouration on his head. The white stripes were then painted on. He has a hand painted vintage millinery leaf on the turban part of his head. He is wearing a handmade paper mask. His arms are vintage chenille. His torso is created from vintage fabric fern fronds and erica moss. In his hands are a handmade party horn and a handmade firework. 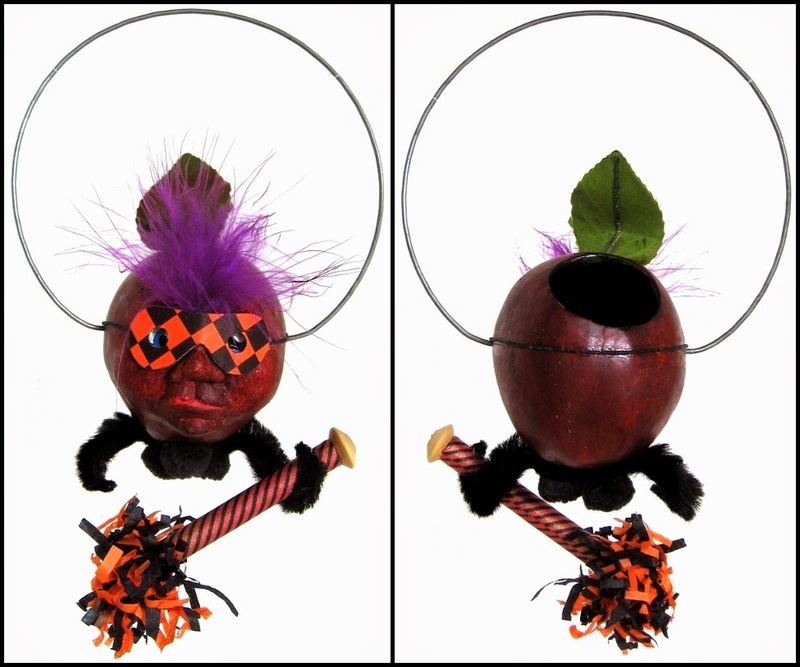 The ornament is 7 1/2" from the top of the wire ring to the bottom of the hand cut paper fringe of his party horn and 4 3/4" wide across the wire ring. He is a candy container ornament. "Fireworks for the Bonfire" - $55.00 US one only. Nigel has brought apples for roasting by the bonfire. We'll drop those off, get his mask on, and then go trick or treating. The complex and beautiful colouration on Nigel's head was built up from bright yellow to oranges and then to various layers of light greens, dark greens, and grey greens. All of the colours were either scrubbed on with a brush or patted off by hand. He was then finished with a spatter of grey green paint. The complexity of the colouration is truly beautiful. 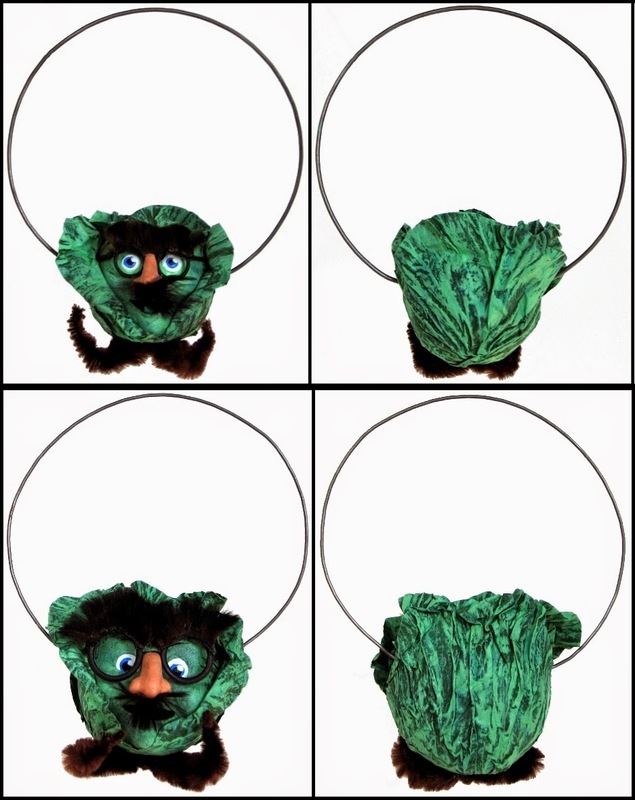 He has a vintage green velvet millinery leaf at the base of the stem on his head. He is carrying a handmade paper mask and a vintage basket. The basket is trimmed with vintage millinery leaves on the handle and filled with painted apples on a bed of wood shavings. His arms are vintage chenille. His torso is created from vintage fabric fern fronds and erica moss. The ornament is 10" from the top of the wire ring to the bottom of the basket and 5 1/4" wide across the wire ring. He is a candy container ornament. "Nigel Brought Apples for Roasting" - $65.00 US one only. Prentice tried on this party hat at Marty's Mercantile and liked it so much he decided this is what he would wear for trick or treating. When I asked him why he liked it so much his response was, " My face doesn't look so skinny!" Prentice started out a light green and the colour was built up with grey greens, then glazes of deep rich greens finished the colouration. In the deep pickle green are some beautiful colour variations. Hand painted papers make up his party hat. The 3/4" head from a early vintage brass paper fastener ornaments the centre of the hand painted orange and black burst of hand cut paper frills. 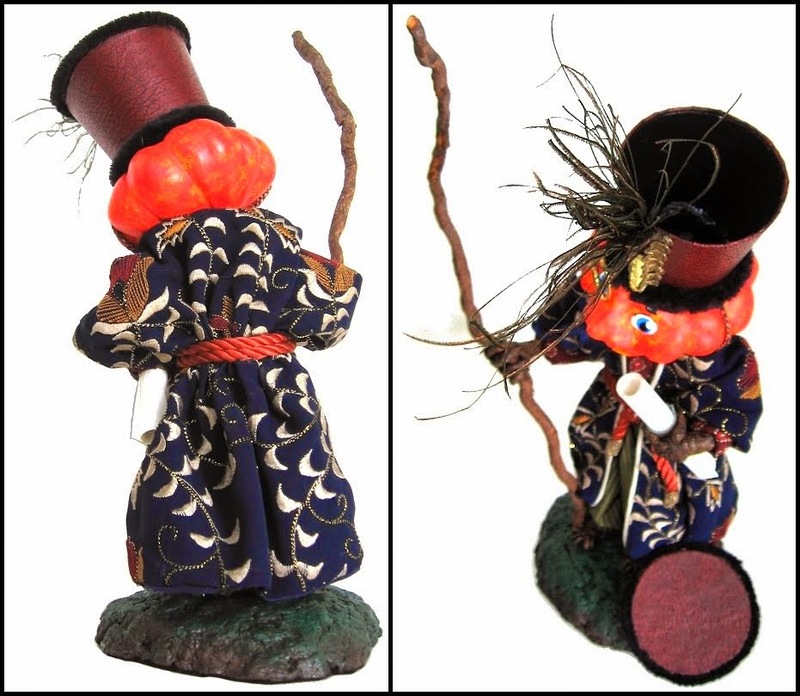 His arms are vintage chenille and his torso is created from two hand painted vintage millinery leaves glued back to back. The ornament is 8 1/4" from the top of the wire ring to the bottom of his torso and 5" wide. He is a candy container ornament. "The Grand Party Hat" - $55.00 US One only. 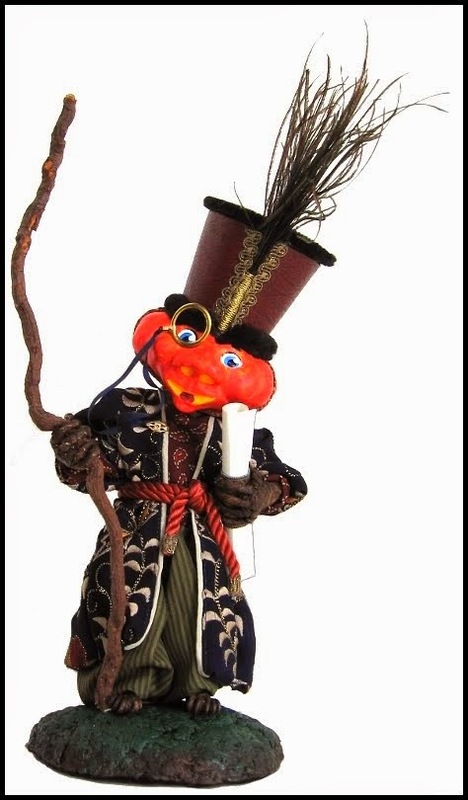 Xerxes left his costume to the last moment because he was so busy doing last minute preparations for The-Man-in-the-Moon's magic show. He is a stage hand in charge of props. He grabbed an old black curtain and quickly made a cape and then used black tape for eyebrows and fangs. He looks scary even for a quick costume like this. Xerxes started out yellow and then layers of orange glazes were painted around the circumference to give an interesting variation to the orange. It looks very carrotish! 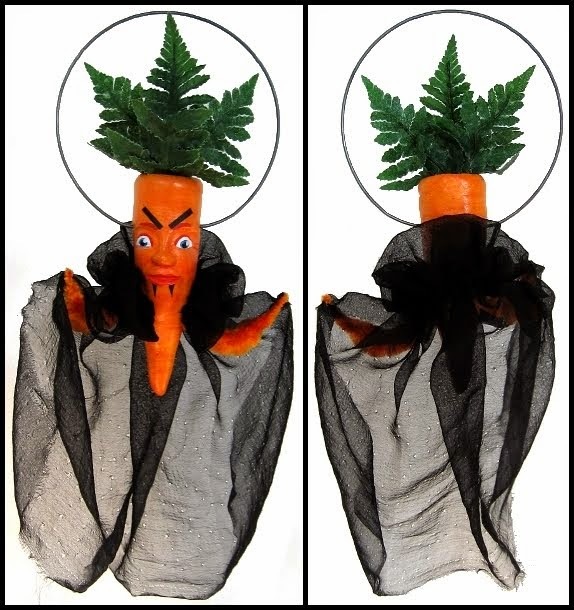 His carrot fronds are made from vintage fabric fern fronds. The eyebrows and fangs are cut from hand painted paper. The cape was cut from an old piece of blouse fabric that originally had beads sewn to it. It is filled with lovely holes and the edge is left raw. The ornament is 11" from the top of the wire ring to the bottom of his cape and 5 1/2" wide. He is a candy container ornament. "Xerxes came as a Vampire Carrot" - $50.00 US one only. Walter Melon is ready to go. He was with Prentice when he bought this party hat. Walter loved all of those orange and black strings hanging down from the top of the hat. The colour was built up with layers of green paint patted off to reveal the light green base coat. His handmade party hat is made from a section from a cardboard cone and vintage fringes. He is wearing a handmade paper mask. His arms are vintage chenille and his torso is created from vintage fabric fern fronds and erica moss. The ornament is 7" from the top of the wire ring to the bottom of his torso and 5 1/2" wide. He is a candy container ornament. "Walter Melon" - $50.00 US one only. Owen loves going trick or treating with his dad. Luke came home with these big nose glasses for them to wear trick or treating. Owen wore his to bed that night. Each base for Owen and Luke is a composition candy container covered with hand painted papers. The papers have been hand crimped and then repainted to look like cabbage leaves. 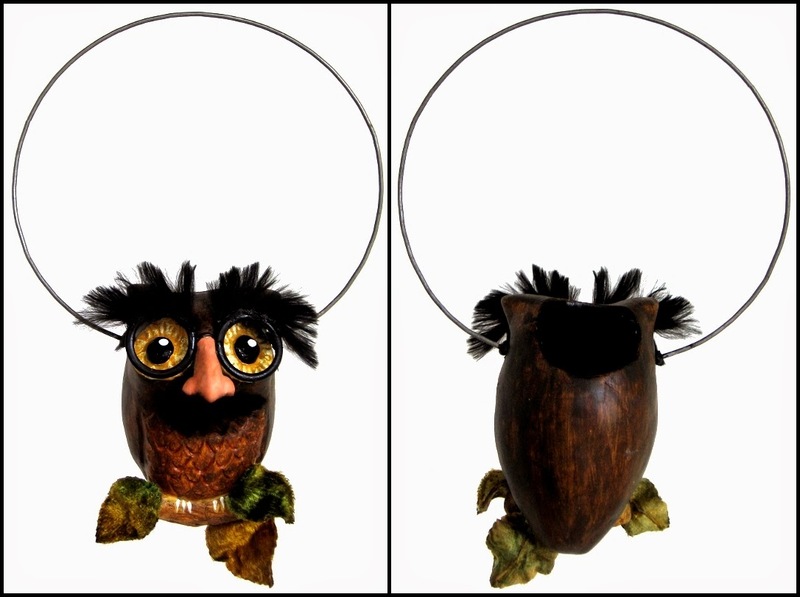 The big nose glasses are made from metal rings, wire, black fur, and a composition nose. They have been securely attached to each face. Their arms are vintage chenille. Owen is 5 1/4" from the top of his metal ring to the base of his arms and 4 1/4" across the widest part of the metal ring. Luke is 6 3/4" from the top of his metal ring to the base of his arms and 5 1/4" across the widest part of the metal ring. Both Owen and Luke are candy container ornaments. 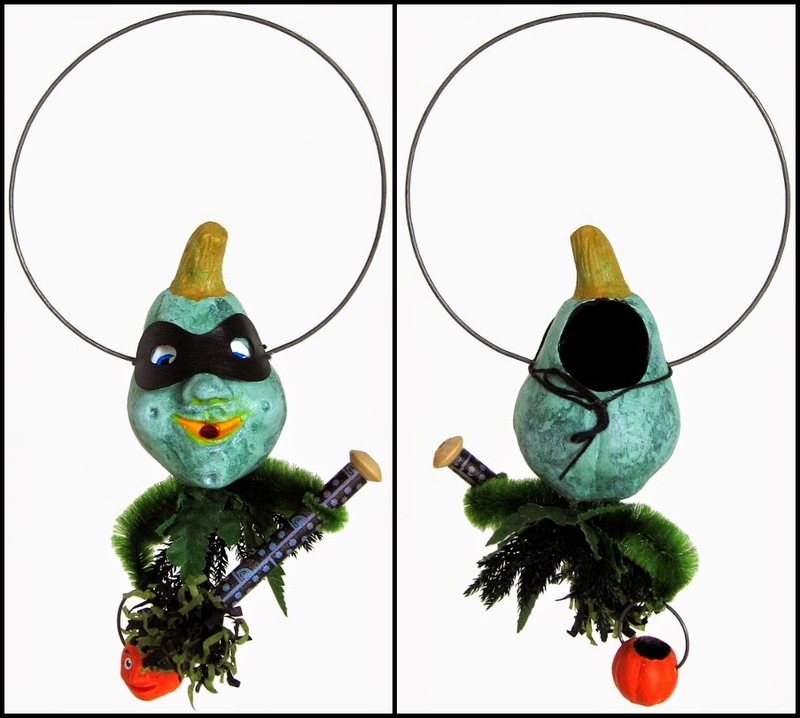 "Trick or Treating with Dad" - set of two ornaments, Owen and Luke, $95.00 US. one set only. Could Jack look any sillier? He doesn't think so and thoroughly enjoys his new look. The paint finish was achieved with a base coat of brilliant yellow with layers of oranges and yellows layered on to give him a rich orange colouring. 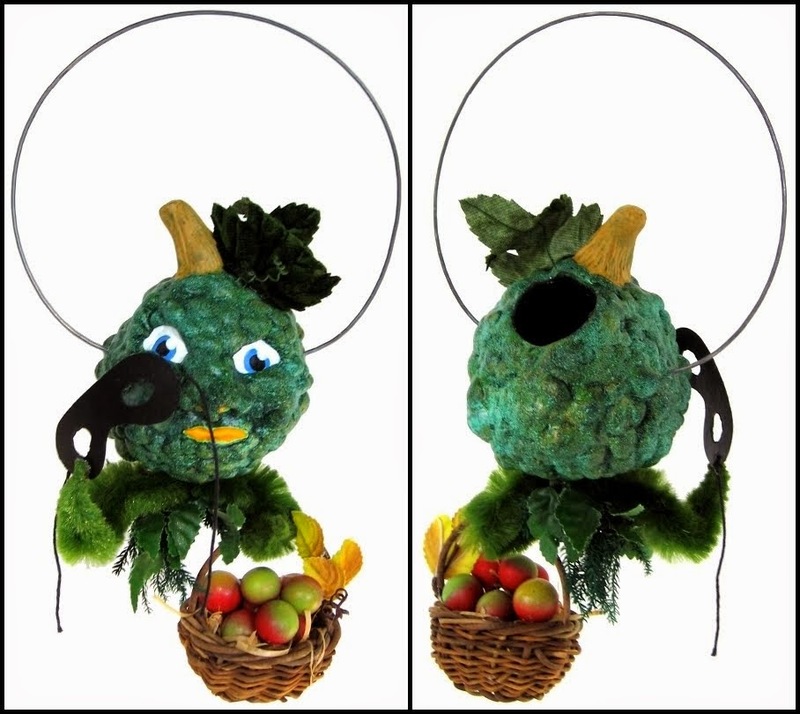 The big nose glasses are made from metal rings, wire, black fur, and a composition nose. They have been securely attached to Jack's face. His arms are vintage chenille. Jack is 6 1/2" from the top of his metal ring to the base of his torso and 4 1/2" across the widest part of the metal ring. Jack is a candy container ornament. "Jack and His Big Nose Glasses" - $50.00 US one only. Since Max has put on his big nose glasses he has been walking with a swagger in his step. He says he looks rather distinguished, that is until he bursts out laughing! The paint finish for Max was achieved with a coats of medium and dark oranges painted on, patted of, and scrubbed on with an old brush. He has a rich orange colouring. 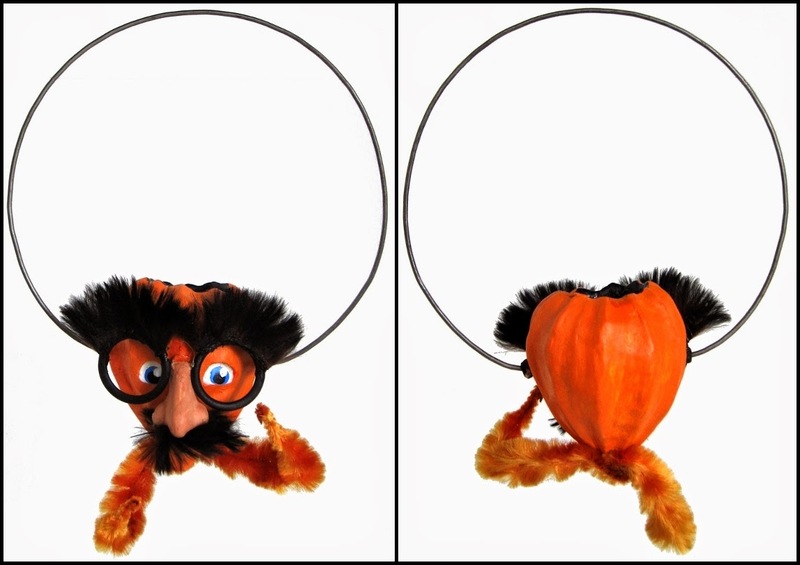 The big nose glasses are made from metal rings, wire, black fur, and a composition nose. They have been securely attached to Max's face. His arms are vintage chenille. Max is 6 1/2" from the top of his metal ring to the base of his elbows and 4 1/2" across the widest part of the metal ring. Max is a candy container ornament. Can you believe it, Carter, the wise old owl or so he says, started all of this silliness with the big nose glasses. He was right though, they have been the most silly and most popular disguise this year. Carter's colouration has been built up on a base coat of medium brown with several layers of a warm dark brown dry brushed on top. 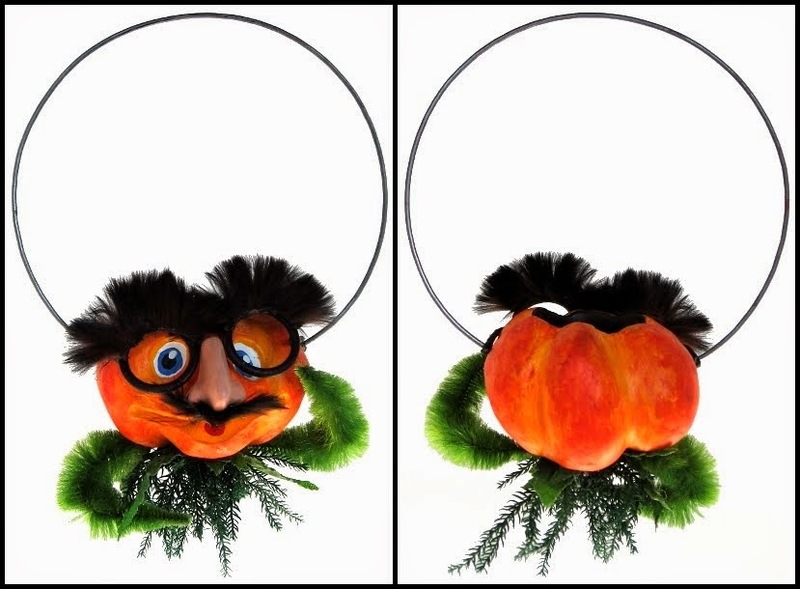 The big nose glasses are made from metal rings, wire, black fur, and a composition nose. They have been securely attached to Carter's face. The limb that he is sitting on is decorated with three early vintage velvet millinery leaves. Carter is 7 3/4" from the top of his metal ring to the bottom leaf and 4 3/4" across the widest part of the metal ring. Carter is a candy container ornament. "The Ring Leader" - SOLD. Bentley, the crow and Carl are the best of friends.Bentley has a nest on the ground that they intend to fill with their swag, at least that is what Carl called it. They are going to fill the basket several times and intend to empty it into the nest. They're not greedy, there were several young children that were ill and didn't have a chance to go out tonight. Bentley is cast composition with wire legs. Carl is a cotton wrapped wire frame dressed in vintage textiles with a vintage tassel hanging from his hat. His head is composition. Both of them are wearing handmade paper masks. Carl has a painted vintage basket resting in front of him. The nest is a handmade basket of paper covered wire. There are two hand painted vintage millinery leaves decorating it. 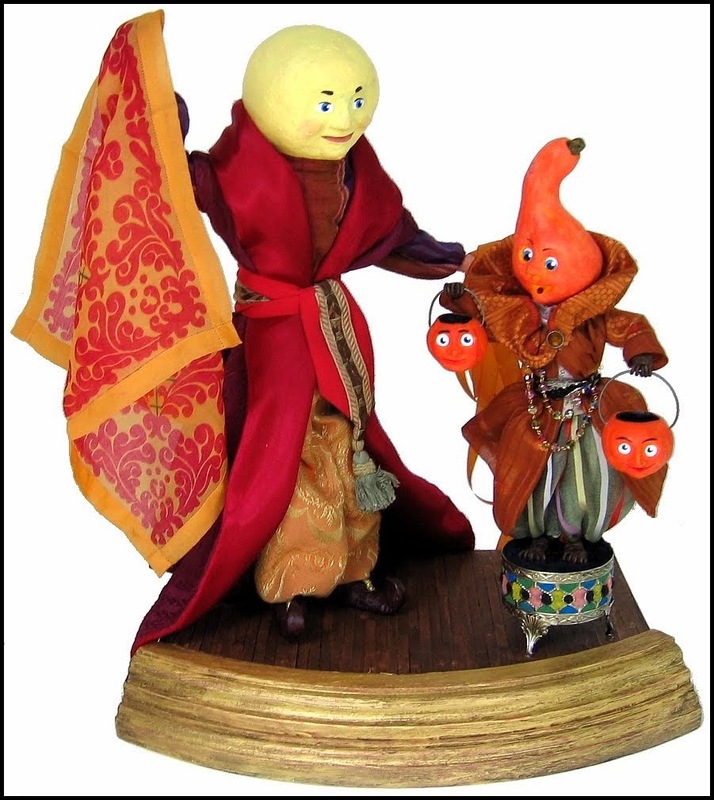 They are standing on a papier mache base. Treats can be placed in the nest, in the basket in front of Carl and inside Bentley. Bentley is a candy container. Gently lift Carl to reveal the interior. 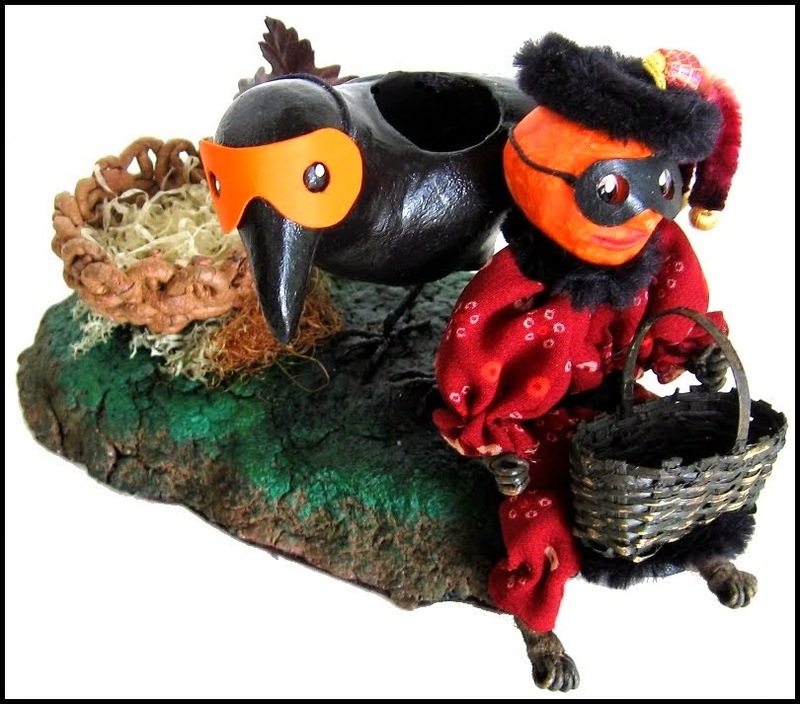 "Bentley the Crow and Carl" - $195.00 US one only. Everyone finishes their trick or treating, has a little to eat and then it is off to see The-Man-in-the-Moon's Hallowe'en magic show. This year's show is "Princess Rosamund and the Attack of the Pie Zombies". Reginald plays "A Dignitary - from a Very Foreign Land". He is in disguise, he is actually "The Evil Conjuror". He enchants the pies of the kingdom , turning them into pie zombies in hopes of taking over the Kingdom. Reginald has a cotton wrapped body over a wire armature. His head is composition painted in multiple layers to give it a rich orange colour. He is dressed in vintage and antique textiles and trims. His hat is vintage leatherette with antique trim and a peacock feather plume on the front of hat. 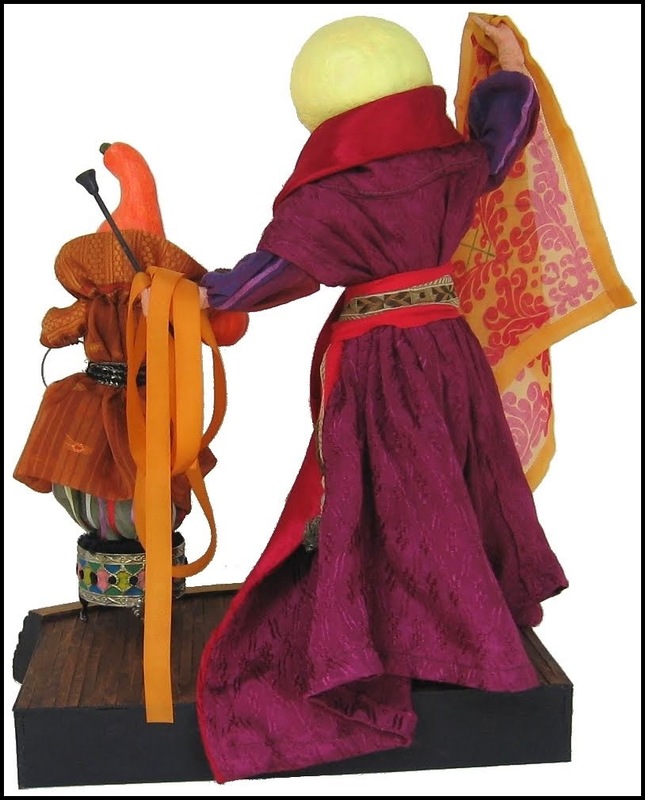 He carries a scroll wrapped with antique metallic braid in one hand and a twisted root in the other hand. He is 12 1/2" tall to the top of his staff. He is standing on a papier mache base. Lift off the top of his hat to reveal that he is a candy container. "Reginald was The Evil Conjuror" - $250.00 US one only. Wally was one of the Pie Zombies. The smaller children were a little frightened when "The Evil Conjuror" passed in front of a pie waving his staff, then to reveal Wally as a life size "Pie Zombie". Wally went out earlier to trick or treat in his stage costume and frighted several young children. They were later heard yelling at the magic show, "It's only Wally!" Wally stands 9 1/2" tall. He is made of composition over a wire frame. There is a vintage millinery leaf on top his apple head. The arms and legs of his suit made from vintage striped fabric. He is carrying a small jack-o-lantern treat bucket. His pie crust is dusted with crushed glass glitter. The back of the pie is painted with multiple washes to look like an old tin pie plate. He is standing on a papier mache base. 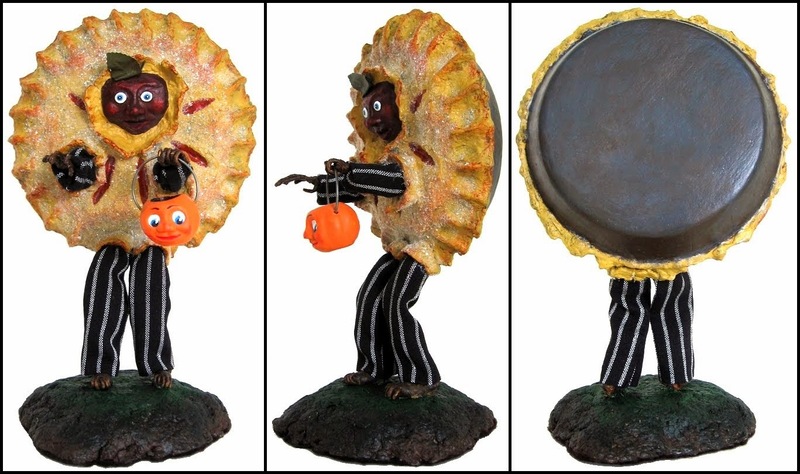 "Wally was a Pie Zombie" - SOLD. Princess Rosamund was trapped by the Pie Zombies and placed into a large cage above the stage. It fell open, she disappeared and a bird flew away. 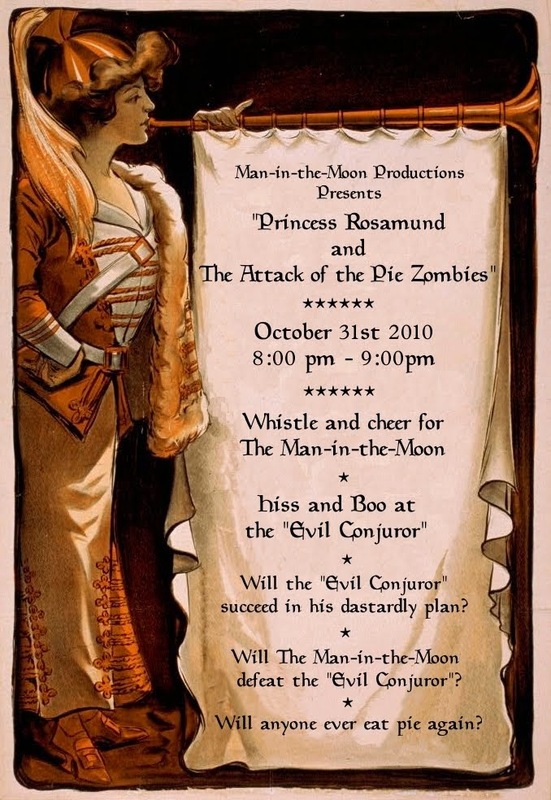 The-Man-in-the-Moon finally defeats The Evil Conjuror, but where is Princess Rosamund? The-Man-in-the-Moon drapes a large scarf over an ornate footstool,lifts it up to reveal the lovely Princess Rosamund. The-Man-in-the-Moon is dressed in vintage and antique textiles and trims. His head is composition painted with several coats of light yellow over a dark yellow base coat. It was patted off to give an interesting yellow glow. In his right hand is a vintage silk scarf while his left hand holds a black staff and a long ribbon of vintage rayon. His shoes are papier mache. He stands 14 1/2" tall. Princess Rosamund is dressed in vintage and antique textiles, trims, and jewelry. An antique button closes the neck of her robe. Her head is composition painted with several coats of orange over a dark yellow base coat. It was patted off giving her head a rich subtle colouration. She is holding a jack-o-lantern in each hand. She stands on a vintage metal glass holder that has been transformed into an exotic footstool. She is 11 3/4" tall standing on the footstool. The stage is created from a 12" piece of oak molding painted an orange red. Gold paint was then put on very thickly direct from the tube to give the effect of old woodwork. It was then rubbed with a deep warm brown for an aged look. The stage floor is 11 1/2" wide and 7" deep. Individual "planks" were glued down to simulate a wooden stage floor. It was then rubbed with the same warm brown that was rubbed on the gold molding. 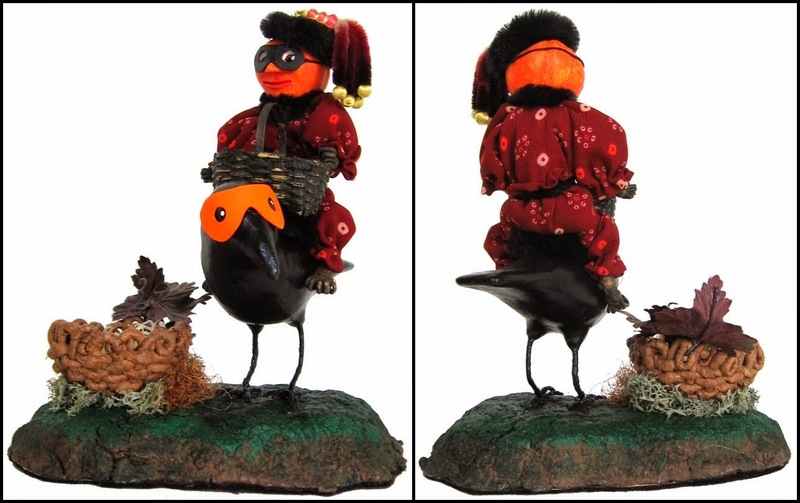 This sculpture is 16 1/2" tall, 12" wide and 9" deep. "Princess Rosamund appears from under the scarf" - $650.00 US one only. 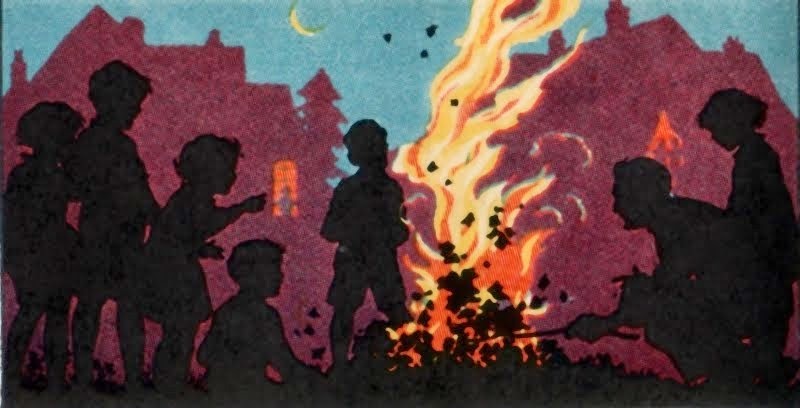 Thanks for stopping by, we're off to the bonfire for some treats and fireworks. 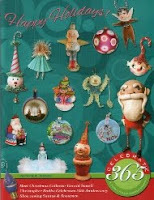 To purchase any of the ornaments contact me here. Sept 14th - Leave a comment on each blog to qualify for a prize from each artist and while you're at it why not become a follower of my blog to stay updated on the goings on at Happy Holidays. If you do not have a blogger acct. Please leave your name & email address with your comment. Thank you! This puzzle is my first prize. You have to get the cord off of the card and then back on again. The graphic is from a vintage bridge tally. 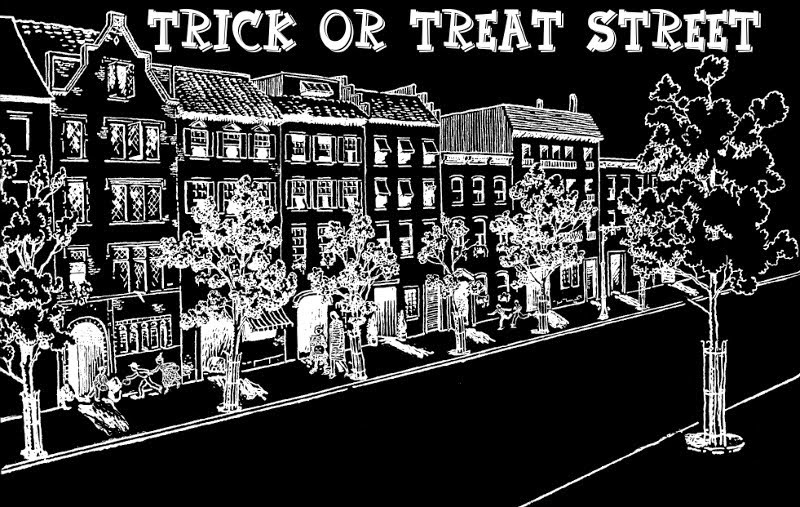 Sept 15th - Mention Trick or Treat Street on YOUR blog, with a link back to me, leave me a comment about it and you qualify for the days prizes. This thaumatrope is my second days prize. Hold onto the cord in each hand twist the cord causing the oval to rotate. 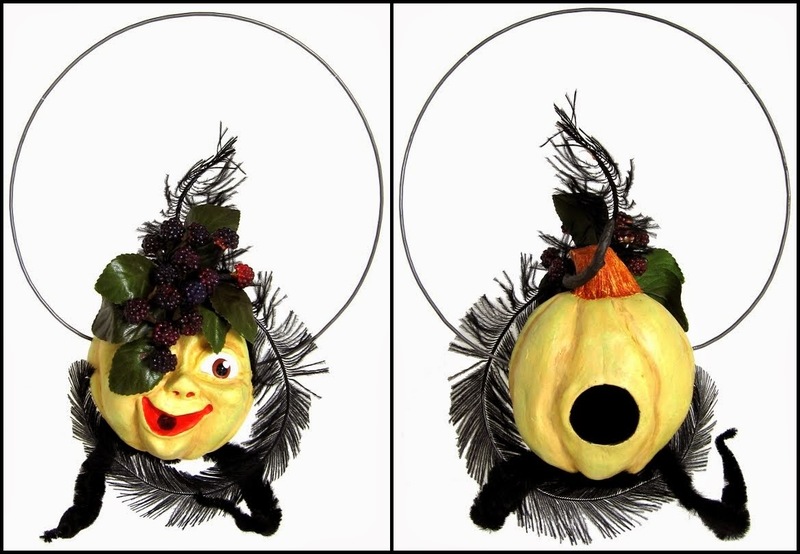 The different images on each side merge to show the jack-o-lantern glowing. It is really a neat effect. The jack-o-lantern is from a vintage bridge tally. Sept 16th - Visit one last time and leave each of us a comment to qualify for yet another prize from each artist. This puzzle is my for the third day. You have to move one bead from one loop over to join the other bead. It can be done! 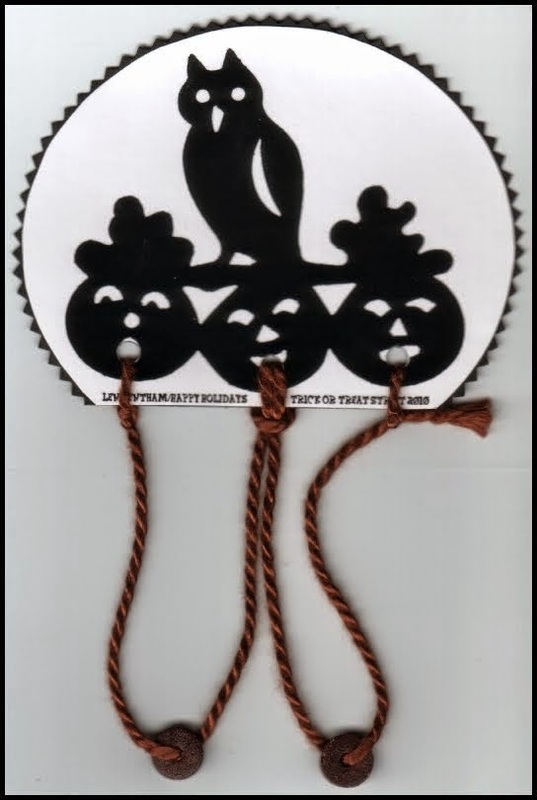 The black owl and jack-o-lanterns are from an antique silhouette decoration. Sept 17th - One lucky Trick or Treater will have their name drawn (at random) from all of the comments and will receive the GRAND PRIZE - An original art piece from each artist. This my GRAND PRIZE offering to one lucky Trick or Treater - "The-Man-in-the-Moon is ready to go"
but there's two other artists who want you to play. click on a link to see what's in store! and have fun with their goings on. Hey Len... don't include my comment in the draw, just wanted to pop in and say WHOO HOO!!! Your pieces ROCK!! Wow Len- impressive amount of work Sir!-I am in love with so many pieces - Can't decide which one I want to take home! How fun! Please add my name! Started following you days ago in anticipation. Your prizes and other work are awesome! Oh goodness... So many tantalizing treats! Such a feast for the eyes! Smashing work!! I love everything! I LOVE the Vampire Carrot and the Pie Zombie!! You have quite a sense of humor in your work Len, I'm still giggling over Xerxes the vampire! Love your Halloween version of old-timey puzzle/games! Please enter me in the drawing! Love you stuff!! Please enter me in your giveaway! WOW!!! What a wicked imagination you have. LOVE all your new pieces. I've got to back a see them all again. I want to go trick or treating with Mata Hari! What a wonderful cast of characters! They all are great! Thank-you everyone for your inspiring comments, it is very encouraging. Back again to try and post! Trick or Treat! GREAT ornaments! Hello Sheryl, Marie, and Deb, glad to see you knocking at the door. You look splendid in your costumes. Glad to see that you finally managed to post your comment Marie. What a magical world you have created! I love all your little people!!! I'd like to call dibs on Ron if he is not already taken. What a fun & festive idea! Thanks to the trio of you for coming up with the premise of this fun event! Len, what is the name for the kind of seed pod that you used for Jack and His Big Nose Glasses. I am raking my brain ... I should know! Sylvia contact me through lenbenny@shaw.ca - He is yours! Connie, Max is a Chinese Lantern. Lori and B came up with the idea. I was invited to join in on the fun. It has been an exhausting blast, so much fun. There are no shows on the West Coast of Canada for Hallowe'en so this is a great venue for me. Sylvia, send me your address and zip code and I will find out the postage from the post office. Please enter me in your giveaway~your work is GORGEOUS!! !Loved looking at all your pieces! Trick or Treat,smell my feet,give me something good to eat. What fun!!! I think all the veggies have made me hungry, who would have guessed that they would be so into Halloween and have such great costumes. Your a true artist and a great insperation. Thank you! Please add me into this :) Love your work! Definitely great pieces! The three artists have done a beautiful job. Please count me in. What fun! All of your trick or treaters are wonderful! Love this event! Thanks for the invitation to this party. Fun, Fun, Fun!!! Love all your pieces! What imagination! Now to go back and become a follower, thought I already was! Len, I am really sorry for the double-commenting (now triple! ); I wasn't sure if I had posted the link to my blog in the first post. I apologize for the extras! I really hope you make more pie zombies! I'm also following you too now! I posted the link at my livejournal because that is where all my followers are. I am having so much fun! That aside, THANK-YOU everyone for your comments. Sharon, don't worry about triple postings, I enjoy hearing from my followers. Thank-you everyone for spreading the word. The great thing about this blog event is that I have come across other blogs that I am now following. It is great to make new friends. I mentioned this wonderful giveaway on my blog! I'm here on day 2....looks like I missed day 1. I will mention it on my blog with a link to one of you 3! Me too please put my name in too!! I just put each of you on my blog with a link back to each of your blogs. Please enter me in the hat draw. I would consider myself extremely lucky to win anything you've created!!! Thank you for sharing your talent! Only treats from me, no tricks. I asked all my followers to stop by and see all the talent you three have created. Thanks so much, this has been fun. So I made it here yesterday, and blogged about it here: http://sleepyhollowfolkartoriginals.blogspot.com/ today! See ya tomorrow! Love this!Thanks for the excitement! Good morning! Please add my name for the drawing! Leaving my Trick Or Treat Have a wonderful day ! Good morning. Back to visit again. Have a great day! Back again~how exciting!I'm thrilled that I'm a prize winner! Len, I just LOVE your devilishly clever cast of characters! Please count me in! Great Fun!! All the artists did a great job!!! Give me a prize that's oh so neat! Love this contest and all of you artwork! I am making a comment...as I must do. Your Trick or Treat Street is quite something new. This giveaway is ...very big, which item I am hoping for ...frankly all of them I swear! Sign me up, for now I am done ! Oh I want forget to post this on my blog...you'll find the link here below. Just to let everyone know, I ended the September 15 draw at Possible Impossibilities Studio and started today's draw at Sharon S. You must put your name in the section after Sharon's name in order to be a part of today's draw. Ken, I only put up one of your comments! I read them all and the one I posted was the only one that said how much you loved my artwork! HAHAHA!!! Thank-you everyone for the wonderful feedback. We are having as much fun as you are. Please add me to your last raffle! I love your Halloween items, what a treat! Love your things and absolutely love the creative way that the 3 of you have kicked off the autumn season. Thank you so much, I have had a great time this week and have enjoyed your work so much. Thank you to you and your fellow artists for allowing us all to participate. Count me in on this round too! chance to win a wonderful prize! Thanks for picking me!! Can't wait for it to come!! Blogged and FBed you yesterday. I see my favorite is going to a new home. And here I am for today's visit, and to admire your cast of characters again. I'm back. Count me in for this trick or treat. I am returning thrice! I am having so much fun Trick or Treating!!! Thank you for having us over for a wonderful party! Crossing my fingers that the third times a charm! I am so glad to have discovered your art thru this! I am back. Congrats to all the winners! It is nice to meet others who enjoy Halloween art pieces as much as I do. This has been lots of fun. I am so glad I found your blog and I will put you on my favorite blog list too. I would love to join your giveaway. Fantastic job on your wonderful whimiscal creatures. TRICK OR TREAT, give me something good to eat. Black cat, Big, fat bats or Chocolate hats! I hope I'm not too late for these very importan dates! I do not think I will be able to trick or treat this year without one of these halloween delights. Great job. I just wanted to stop by and say THANK YOU!!!! this week has been so much fun. I can not wait to see what the veggies will be up to and wearing in the future. Im certainly a follower of your blog now and will be stopping back often to say hello. I received my thaumatrope yesterday. THANK YOU so very much! I Love it. What a special treat. And I had fun trick-or-treating on your street! Thanks for sharing that material your blog is very useful. I’ll probably be back to read more.